It seems like child sponsorship has become a trusted pillar of development fund raising over the past two decades. Well known organizations like World Vision and Save the Children regularly encourage westerners to sponsor children in developing countries. But to what end? What, exactly, does child sponsorship accomplish in terms of ending the cycle of extreme poverty? Does it simply better the life of one individual while her family and peers continue to fall farther below the poverty line? In both their brand promise and purpose, FH Canada emphasizes a commitment to communities. Can the promotion of individual child sponsorship be consistent with that messaging? They would argue that it is. Consider the case of Marie Louise. Marie Louise's family of seven in front of their home. Marie Louise is a sponsored child living in Ntwali, Rwanda. She was born into challenging circumstances, to say the least. Her father, Kagabe, is disabled to the point of not being able to stand or walk without support. The family did everything they could to provide him with the best medical treatment available, even selling all their belongings to pay the bills, but to no avail. It appears his condition is irreversible. One repercussion of their deepening poverty was the lack of resources to pay the mandatory school fees and supplies - Marie Louise’s two older brothers were forced to drop out of primary school. Not long after, Marie Louise also had to quit her education. As a result of the funds received from child sponsors, Kagabe was able to send his daughter back to school, and her family received medical insurance and income-generating aids like agricultural tools. Marie Louise almost dropped out of school for a second time when she failed to pass her primary school graduating exams. 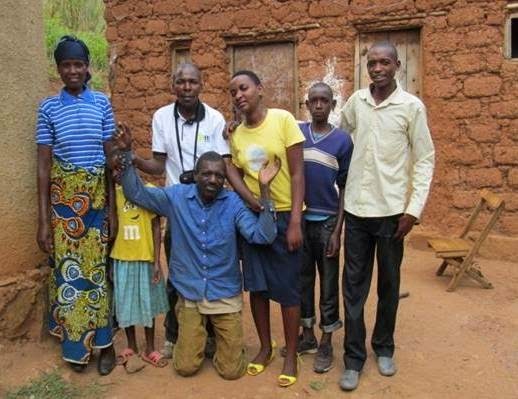 Fortunately, the FH Rwanda staff was already in place to provide her with encouragement and help. Because of these supportive relationships, Marie Louise was able to persevere through her educational set-backs, and eventually pass her university entrance exams with flying colours. To date, she continues to crank out top marks. As you can see from Marie Louise's testimony, child sponsorship at FH is not just about the individual. The financial support given by her sponsors provided her entire family with medical care, income-generating tools and training, and empowered her parents to send their daughter back to school. Now their Marie Louise is planning her future and considering how she can give back to her family and her community - she is preparing to invest in the lives of others and help stop the cycle of poverty. When child sponsorship is part of an integrated, holistic development approach, as it is in Ntwali, the whole community benefits, and child sponsorship is a success. Visit the FH website to learn more about community focused child sponsorship.